Keeping registries accurate and complete within the value-based landscape is top priority. Never before has access to current and historical patient data been so critical to care delivery. Today's quality-driven landscape demands that health care organizations design strategies for collecting and analyzing patient populations for more effective clinical response. For decades, registries have existed to help health care professionals track trends and better understand the greater cancer epidemic. In fact, Eric Durbin, DrPH, MS, suggests that registry data supersede the effectiveness of current HIT movements in addressing the disease. Serving multiple roles, including director of cancer research and director of cancer informatics with the Markey Cancer Center's Informatics Shared Resource Facility at the University of Kentucky, Durbin notes that "in spite of the overblown expectations that electronic medical records stand to revolutionize the treatment of cancer, the best source of information that identifies each diagnosis of cancer, the treatment directed at that cancer, and the long-term outcome for that patient's cancer remains the human-curated cancer registry." As health care analytics drives population health initiatives and the face of cancer care, the completeness of cancer registry data becomes even more pivotal, says Karen Monahan, MHA, CTR, a registry product specialist with Elekta. "The ability to trend care patterns and outcomes is at the fingertips of cancer registrars. However, when those data are routinely incomplete, the resulting analysis is not reliable," she explains. "Completeness of cancer registry data takes the shape both of incomplete case finding, resulting in an underreporting of overall incidence, as well as incomplete treatment reporting." April Stebbins, RHIT, CTR, supervisor of tumor registry at Baptist MD Anderson Cancer Center in Jacksonville, Florida, points out that cancer data are becoming increasingly transparent as more organizations and professionals leverage it for future prognostications, making it essential that data are not only complete but also timely. In hospital settings, the use of registry data extends to functions such as projecting future patient volumes, budgeting, staffing, and expansion, as well as industry research and state evaluations of cancer control programs. For example, Durbin points out that central cancer registries have been used to pinpoint key trends, including the fact that breast cancers HR+/HER2 are the most common for all races and ethnicities, with the highest rates occurring among non-Hispanic white women. These data also have shown that triple-negative breast cancers—the subtype with the worst prognosis—are highest among non-Hispanic black women. "Epidemiology studies can be skewed if missing data are analyzed, especially in rare cancers where the numbers are so low to begin with," Stebbins notes, adding that the adverse effects on survival estimates can also be affected. In a value-based environment, industry professionals agree that health care organizations must prioritize the accuracy, timeliness, and completeness of cancer registry data while also acknowledging the difficulty in achieving these goals with lean staffs. Time is the biggest inhibitor, according to Jennifer Zahn, CTR, senior manager of oncology data services at HealthPort/Care Communications. "Often what happens in registries is that there just isn't enough time available to abstract the caseload and meet the other duties and requirements," she says. "Appropriate staffing is a big thing for timeliness." As health care organizations consider strategies to ensure the integrity of cancer registry data, experts weigh in with suggestions on how to keep data accurate and complete. • National Cancer Data Base (NCDB) submissions, if applicable. "Those are the big items included in the quality control standard and really go for any registry with the exception of the NCDB," Zahn says, adding that while accredited registries have at least some form of quality control in place, strategies may lack a comprehensive approach. "A number of state registries have processes in place also to look at the data. If states start to see issues or have questions, they will sometimes come back to registries and look at them." Affirming this fact, Stebbins points out that the state of Florida performs edit checks on all uploaded records. "Our registry software vendor has built not only the state edits but also other edits into the program," she says. "Each abstractor is required to run these edits when completing a chart. This provides for immediate feedback and corrections before ever being sent anywhere." Sandra Gamber, CTR, CCS-P, a product specialist at Elekta, says registries use standardized edits to ensure quality control, whether they originate from a central registry or another national standard setter. In addition, she suggests that organizations would be prudent to monitor data on a regular basis by generating reports to check for missing treatment information. "Often, the astute registrar becomes familiar with the types of treatment offered to patients with a particular tumor based on the physician who provided care," Gamber explains. "Before they even complete the abstract, they are looking for the possibility that a piece of the picture they are painting is missing essential brush strokes." In essence, Gamber suggests that quality control extends to investigating to determine whether further information is needed to close gaps. Identifying these holes can be accomplished by creating reports on subpopulations of data based on primary sites, date ranges, class of case, and other criteria. "The power of registry data is there every day," she says. "[Registries] need to feel comfortable with their data and work with them on a continuous basis to harvest the most out of this commodity that they have toiled so hard to assemble." While achieving a foundation of valid, timely, and comparable data is essential to making cancer registries relevant and usable, achieving this level of quality can be challenging. According to Gamber, the first step to keeping cancer registries on course is to use national standards as well as policies and procedures issued by central registries. "We have national standards in place that allow for registries in all the corners of North America to use the same code and description for data elements so that the data can be compared," she says, adding that these standards eliminate any concerns that the definitions of laterality and primary site codes will vary from one state to another. "Edits are often designed to keep the data in balance. It includes logic written into the edits that allows for only valid values to be coded for particular data elements." To that end, the North American Association of Central Cancer Registries (NAACCR) develops and promotes uniform data standards for cancer registration, provides education and training, certifies population-based registries, aggregates and publishes data from central cancer registries, and promotes the use of cancer surveillance data and systems for cancer control, epidemiologic research, public health programs, and patient care. Stebbins says Baptist MD Anderson Cancer Center has a number of processes in place to evaluate validity, including reabstracting, reviewing concerns at weekly coding meetings, and software edits. "The reporting agencies have their own standardized definitions and abstracting instructions, so it is very important to follow these standards and not just rely on memory or depend on the registry software's drop-down menus to provide the detailed information needed to make the correct choice," she says. "A yearly review of case-finding methods is also essential to make sure all sources for case finding are being utilized and to update any ICD-10 code changes." Because of ICD-10's expanse and granular nature, Monahan says it's important to evaluate case-finding processes. "It is the optimal time to scrutinize the case-finding protocols for the cancer registry and ensure that they include an arsenal of methodologies," she says. "The cornerstone of efficient case finding should be an electronic download of eligible cancer cases into the cancer registry's reporting software. This should be supplemented by a review of other source data, including pathology reporting, positive radiology findings, medical and radiation oncology consults, and treatment lists." While the timeliness of registry data is often mandated by central registries that must meet certification deadlines, Zahn notes that it's also a matter of resource allocation and "making sure as best you can that there is the time allotted to abstract." Estimates of completeness are most effective at the population level when conducted by a population-based central registry, according to Durbin, who points out that the NAACCR has developed an estimating model that utilizes cancer mortality data compiled by state vital statistics departments to estimate the incidence of cancer in each central registry's population. "Estimates derived from the model are compared with incidence data submitted in order to certify central registry data for case completeness, as well as other data quality measures," he explains. "The NAACCR's estimating model applies incidence to mortality rate ratios observed by the National Cancer Institute's Surveillance Epidemiology and End Results database to calculate incidence estimates for each state by cancer site, gender, and race." Durbin acknowledges that estimating models are imperfect and based on a number of assumptions. However, he adds that the incorporation of an objective cancer mortality measure from a source external to the registry is a strength of the NAACCR estimating model. "Without a quantitative technique based upon known facts, we may be left to just guessing," Durbin says. "For example, other estimating methods have relied solely upon historical case counts. The fundamental problem with this approach is that if a registry has historically undercounted, this technique will never reveal it." Stebbins has found that comparing the current year's data with those of the previous year provides a solid measure of completeness. By comparing the previous year's numbers, registrars can make assumptions and identify potential areas of concern. Stebbins, along with Durbin, point out weaknesses in the methodology. "Based on the quantitative method, you would think the completeness is correct, but sometimes you have to ask yourself if something changed to cause a fluctuation in the numbers," Stebbins says. "Several things can explain a reason for a drop or increase in numbers, not just missed cases. Always look for other reasons before thinking your data are incomplete." Should time permit, Stebbins believes reabstracting is a sound idea, pointing to the fact that Baptist MD Anderson Cancer Center attempts to reabstract 25% of each week's cases. "It's time consuming but an excellent quality review and educational, especially for the new registrars," she notes. While reabstracting can be a valuable tool to conduct quality assurance audits, Zahn suggests that time constraints make it impractical for many registries. "If the time is not there, there are other ways to review the information without doing a full reabstract," she explains. Monahan and Gamber suggest that performing regular quality assurance checks may be a better option than reabstracting. "A more targeted approach to quality can yield broader adherence to high data standards," Monahan says, adding that the reabstracting of data can occur only on a limited scale. 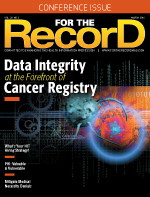 "By using the reporting functionality of registry software teamed with a good understanding of cancer registry data quality, it is possible to analyze registry data in its entirety as well as focused subpopulations with ease." Gamber explains that this method of abstract review, whether by registry staff or physicians, helps point out areas for possible improvement. "This can be used to educate staff on new treatments being offered at their facility and the proper code to use," she says. "Items to watch for in the medical record can be pointed out after hearing of clinical trials and advanced treatments that were discussed at local, state, regional, and national education conferences." Conferences also present opportunities for registrars to converse with colleagues about the type of reports they're generating to monitor quality control, Gamber says, adding that the Internet is a strong option for those unable to regularly attend industry get-togethers. "The various resources that are provided by the standard setters with just a click of a hyperlink provide a wealth of education material that can then be used to perform quality analysis on your data," she says.